As you can tell, I am by no means a web designer! For the past several years I have relied on templates, my basic HTML skills, and tech support through my hosting company to keep eleventeenapparel.com afloat. I am so happy to say that Kyrie Elayne Web Design is going to build a new website for me! Kyrie is going to make it much easier for you to browse and purchase clothing. There will be a link to my blog and ways to get directly to my Facebook and Twitter pages. I am so excited about this! So, if my website is down for a bit, just know that she is working on it and when it reopens it will be fabulous! Things have been crazy busy here lately! My kids finished school last Friday. However, I still have a lot of work to do in order to finish their portfolios and have them ready for review. The sewing room has had a thorough cleaning and the last bits of thread and costuming fabric have been swept away. Bring on tourist season! I have been working hard to get my new items ready to ship down to Brooklin. Public schools will be winding down over the next few weeks, and Sihaya has been busy getting her gallery ready for summer traffic. 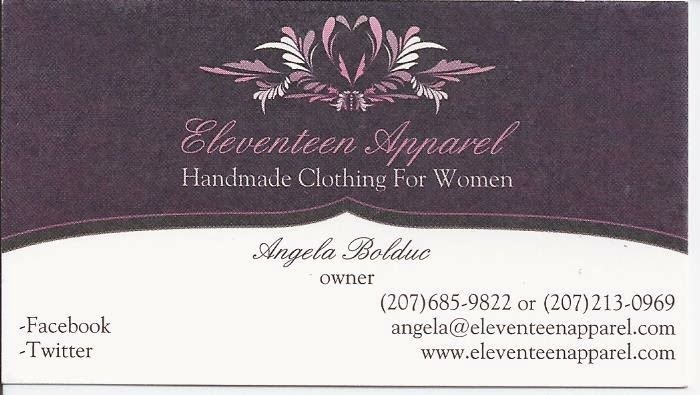 I will be sticking with some of my tried and true designs such as the twisted dress, top, and ruffled edge cardigan. 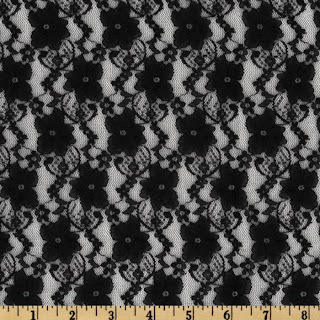 These will be coming out in new colors and possibly a pattern or two. 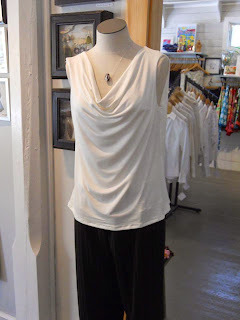 In addition to these staple pieces, I will be sending down some super soft cowl tanks in various colors, black lace party skirts, and chiffon tie tops in two colors. Here are a few pictures of the new cowl tops and the party skirt. I do hope you find yourself in the Blue Hill area this summer. While in the area, continue the drive to Brooklin. You won't be disappointed! Another exciting dance season has come to a close. I had the pleasure of watching my little princesses dance their hearts out on stage over the weekend. They have worked hard all season, and it is so rewarding to watch the end result! They both love dancing so much and are already talking about dance camp which will be coming up this summer! Along with watching my girlies, I was also able to see my costumes in action! Here are a few of my favorite shots from each routine. Costume season has officially come to a close. I took on a large job this year of designing and constructing two sets of costumes (a total of 30 costumes), plus making an accessory skirt for an additional 17. It was a long season, but a very creative and exciting one! I love being able to create stage pieces. This kind of work allows me to think outside the box and create pieces with flair. Color and movement of fabric is more of a focus than actual wearability. Matching costume design to music selection is crucial. Projecting the emotion of the dance routine from the stage to the very back of the audience is the ultimate goal. 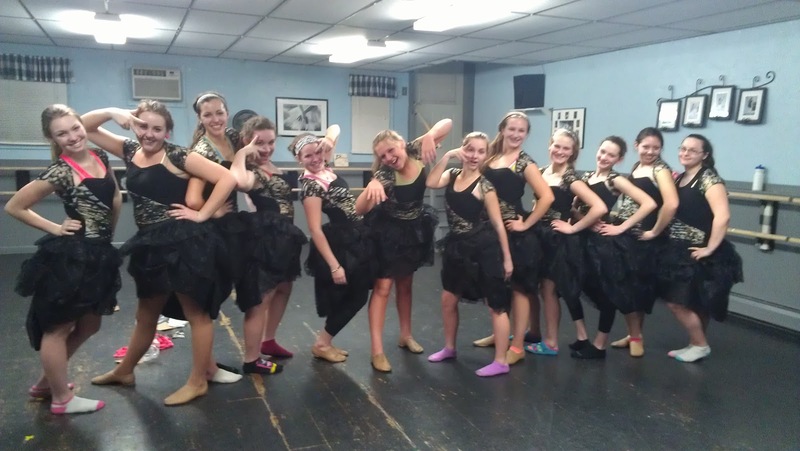 I'm so thankful that I could be a part of another season with Stage Presence for Dancers! Recital is going to be held the last weekend in April. I will be sure to post some pictures from the show! Spring clothing production has started. Blossom Studio in Brooklin will be seeing an increase in business in the coming months as the summer residents flock to the coastal region. I will be sending black and white pinstripe pants with a coordinating cowl neck top to the boutique along with some new colors/patterns in the twisted dress and tee. The twisted dress was a big seller again last year, so I do plan on keeping those well stocked! New dance and yoga apparel designs are on the horizon. I have drafted a fold over waist yoga pants pattern that just needs to be sized. New colors for fold over dance shorts are available to order on FB or directly through angela@eleventeenapparel.com. I am also working on a high waisted dance short and some simple tanks to go with the bottoms! Finally, my Etsy shop is getting an overhaul. I will be using Etsy to sell overstock, one-of-a-kind items, and last season's merchandise at a reduced price. Check there often as I will be adding and updating stock frequently! Here's a peek at the finished lace skirts that will be worn by this lovely group of girls at the Stage Presence for Dancers recital this spring! In other news, I will be changing up my business offerings a little bit. Due to the strong interest in dancewear, costumes, and athletic apparel, I will be concentrating in those areas. I will no longer be offering formalwear, custom orders/sizing, or outside alterations. I will still be offering a variety of styles available in ready-to-wear sizes of XS-XL. Select pieces will be available in plus sizes and children's sizes. New styles will be available in retail shops and boutiques throughout the state. My website and Etsy shops will be made up of mostly last season's styles, one-offs, and limited editions. I look forward to moving forward with the new plan! By doing this I will be able to turn all of my attention to what is best received by my customers!